I like lockboxes. There. I said it. I do, truly, unironically, like lockboxes. What I don't like, of course, is paying for them with real money. In-game money - gold, karma, reputation, pretty shells you pick up from the beach - that's fine. I don't mind paying imaginary money to open imaginary boxes. Where I draw the line is paying money I could use to buy something more tangible like, oh, I don't know, food? I'm a huge, huge fan of RNG in MMOs. If I had my way there would be at least an element of chance in every possible transaction, from whether a crafted item turns out to be exceptional or below-average to the standard path to upgrading your armor. As for drops, as we call them, I freakin' love drops! What I find tedious, dull and unimaginative are trading systems where you earn tokens and buy things from a vendor. That is too much like real life. Dragon's Stand. Please clear inventory before arrival. GW2 has its share of token systems but fortunately for me ANet are much more obsessed with delivering loot of all kinds inside boxes. Boxes and bags. It's long gone beyond parody. After any major event it can take me up to half an hour to go through my inventory and open all the bags and boxes I've acquired. Seriously, it has actually taken me half an hour in real time, although to be fair some of that was time taken clearing space to receive each new burst of goodies and not-very-goodies. I did Dragon's Stand tonight and it took me almost twenty minutes to open everything I got. EQ2 likes to use flashy ground chests but generally the game tends more towards direct drops because, for all the ridiculous things SOE and DBG have done over the years, at least they never invented "Magic Find". Magic Find is a ludicrous stat used in many F2P MMOs under various names. It purports to increase your chance at getting better drops. Originally GW2 included it as a stat on gear but that proved controversial, with people being kicked from Dungeon groups (remember them?) for wearing Magic Find gear rather than something useful for killing the mobs that drop the loot in the first place. These days it's a character stat instead. On my main account my Magic Find is 330%. I'm not going to explain how that works. Just roll with it. Magic Find is bloody useless. With a handful of exceptions it only works on direct drops, although you'd hardly know it. In theory it includes hyper-rare items like the Precursors for Legendary Weapons. In five years, on six accounts, with thousands of hours played, Mrs Bhagpuss and I have received one precursor each. I hate to think how much worse that drop rate would have been if we didn't have MF! The reason ANet loves putting drops in boxes is that it protects them from Magic Find. First they add the stat, then they make it useless. Brilliant. The first rule of magic find is we don't use magic find and that's also why we can't have nice drops. Of course, no matter how bad something is, it can always get worse. In the upcoming Path of Fire expansion we are apparently getting a new system wherein loot will drop as "unidentified". We'll then either have to take it to an NPC and pay to get it identified, at which point we'll find out if it's worth anything or just fit for salvage. Or we can cut out the middleman and salvage it unidentified. This is proving controversial, although not very. The main thread on the topic didn't manage a hundred replies. I'm betting most GW2 players don't know about the change yet so the real shouting won't start until launch day. Who knows, maybe it'll be popular. At least the unidentified items stack. Anyway, I like opening my bags and boxes and so, as long as no real money changes hands, I find lockboxes are 100% acceptable as well. They're fun. More than that, they're exciting. They have interesting things in them, as you can see from the recently-added inspection feature, although in my experience most of those interesting things stay inside the box. They certainly did today, when I logged all my accounts in to grab the free "Customer Appreciation Package" from the Trading Post. It turned out to be a Black Lion Chest (aka lockbox) and a Black Lion Key to open it. I opened one on each account, three of them (F2P players aren't "customers" apparently, which I guess is technically true if not something game companies usually say out loud). The only remotely interesting thing I got was a dye. Everything else was embarrassingly dull. Leaving aside the name, which I can only assume is a marketing department in-joke, the clear and obvious purpose of this free taster is to encourage players to buy Black Lion Keys, which by an exceptional co-incidence happen to be on sale right now. I did once work in Marketing. It was a long time ago but I think I can still remember how it goes. Something about getting people to use your company's products or services more, not shun them like a fatal disease. I'd have thought it might be worth rigging the odds on these infrequent freebies so that everyone gets at least a halfway decent item. The dye would do it. A mini, perhaps. Nothing amazing, just not a Bank Express and a 30 minute booster. 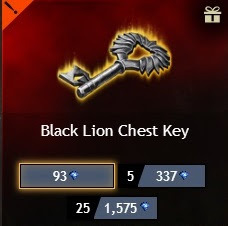 Had there ever been the slightest chance that I might one day buy a Black Lion Key to open a Black Lion Chest (there wasn't) this utterly pathetic experience would have put the can on it. As a promotional device it's up there with "Two For The Price Of Three" (an actual promo run by a London bookshop once - it did at least get them some free publicity on national media...). 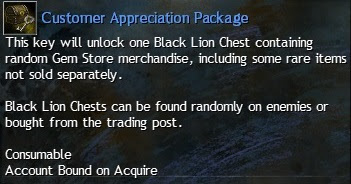 None of which is going to stop me squealing with excitement and linking it in guild chat next time I get a Black Lion Key for free (they do drop, incredibly rarely, and you can often get one for completing a map). I still love lockboxes! Looking at that screen shot of Dragon's Stand my first reaction was, "Is that Rift?" It has that sort of feel to it, visible Charr not withstanding. I think it is the ground texture that triggered that. Yes, it's true. It does seem to have different ground textures to most of GW2, although I think they are elsewhere in HoT. It reminds me of Stillmooor. Gameplay is a bit like it in places, too. I like the RNG of lockboxes as well, but hate paying cash for them (much like you). That is the big problem with Fortnite right now is that you can't get loot in any sort of fashion that feels like it is quick enough. When you do get it, there is such a slim chance you want it/its good / you need it that I can't be bothered to play anymore. When your RNG is terrible, they should be giving away those llamas just for logging in, not for slogging through 2-3 hours of play for a 0.5% chance of something good. Fortnite is getting bad press in every direction for both its gameplay and its monetization. Hardly persuades me to investigate it any further. The latest patch introduced a game mode with promise (Survival mode) and they greatly increased the rate at which you gain the in game funds to get the in game loots. There is hope yet... however faint. On the outset it felt like a cross between Landmark and a cartoony The Division which works well. On paper. And it is shameful just how pathetically dull and unexciting GW2's black lion chests are. First of, which lockboxes besides GW2 let you earn a -fraction- of a desirable skin or reward? Token buy is token buy, lockbox is a lockbox, you don't put token buy INSIDE a lockbox. Any hero shooter or MOBA's lockbox will have individual actual skin items that pop out, even if it's not the part or hero that you want specifically. I've bought the odd Crusaders of the Lost Idols lockbox, they specifically tell you there's a chance of getting items for XYZ heroes, and when you open them, you get items for XYZ heroes plus bonus stuff, not fractions of currency that will get you items for XYZ heroes. Path of Exile lockboxes give you solid skins and effects per lockbox opened. The "trap" is you get duplicates while looking for your desired one skin. But they still give you -one- item. Not, "oh, collect 9 more scraps and you can exchange it for...Oops, I lied, 10 scraps is only half an item now." It's the worst handling of human psychology for lockboxes ever. Just put a guaranteed dye or mini or better yet, wardrobe unlock, into each lockbox and the desirability factor will go up tenfold. Even if the buyer has collected every cheap dye and mini, they will still rationalize "nevermind, that's 20s from selling it," and keep going from there. As of now, people open one, get a transmutation charge or a mystic forge stone or a repair canister and go, "welll, that was a gigantic waste of time/money, I'm never gambling again." Good analysis. Yes, they really are awful. I've always thought most of the stuff in the Gem Store is rubbish, too. Certainly precious little appeals to me. Belghast has a good post up about why some of the things in the Gem Shop are good value but as I replied there, those are things that I feel would actively reduce my enjoyment. ANet have a very odd idea of how best to monetize their game in my opinion but they seem to stay in business so I have to concede that they must know what they're doing, even if it doesn't suit me. If it is lockboxes you crave, Defiance ought to be your ideal game. It's all lockboxes, all the time. Paid or free, they're everywhere. On the broader topic of RNG, I appreciate it when it's a bonus. I like WoW's Warforged/Titanforged and bonus stats systems, as it means any item can be useful and adds some personality to loot. My Moonshatter Gauntlets might be a lot more powerful than your Moonshatter Gauntlets. But I strongly dislike being totally reliant on RNG to advance. I would much rather a token system, because then you can make measurable progress and have a clear idea when you're done. Much better than killing the same boss for six months and still being no closer to the item you want (not a hypothetical -- that actually happened to me). Token systems are also a good way to keep all content relevant, as it can all award tokens in varying quantities. Whereas with just drops you usually end up only killing whatever it is that drops the item you want until your eyes bleed. But then again I'm rather over the item chase in general. Loot doesn't hold a lot of excitement for me anymore, no matter how you get it. This is very much a personality or psychology thing. In eighteen years of playing MMOs I have never wanted any drop enough to camp it for more than a couple of hours, once or twice. In most MMOs my main problem would be finding anything I wanted at all, not worrying about there being things I couldn't get. The main reason I like RNG is that left to my own devices I would make do with whatever was easiest and cheapest to get. RNG means I sometimes get really nice things that I would never in a million years have made the necessary effort to get otherwise. Plus I like chaos more than I like order in my imaginary life - the opposite of what I prefer in my real life. Hmm. I also im on the side of token systems. Games in which the reward for finishing a dungeon includes some tokens delivered the best and most enjoyable gaming experience to me. The team went in together, did the content together, got the tokens. Everybody was guaranteed to have some Profit from doing the dungeon, so everybody was happy. In contrast, i still have terrible memories of those games where loot was rolled upon. Without a DKP system, people felt cheated by the rolls, as some of the same group of people geared up in just a few dungeon tours, while others did a dozen and still had no gear. (Add to the drama that those who had all the gear they wanted suddenly lost interest in the dungeon and moved on. ) With a DKP system in place, things looked a tiny bit less frustrating, till people started to game the system, so again others felt like they lost out. 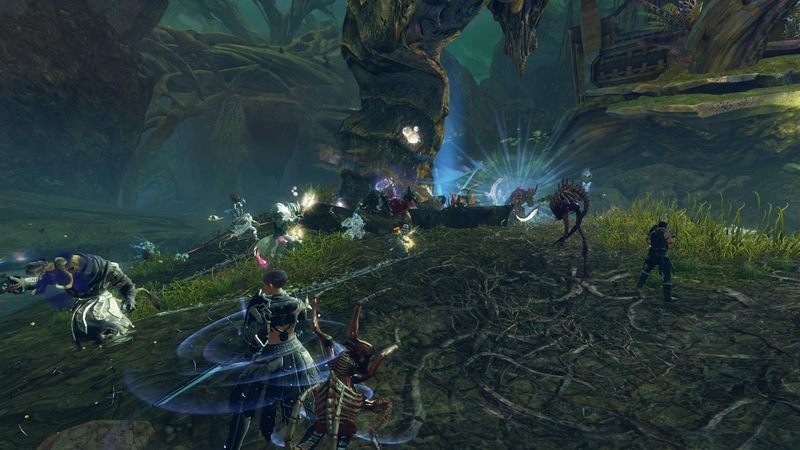 Loot in GW2 is in between: it drops randomly, but individually. But as you already said, the game swamps you with garbage, while actually useful loot is a "once in a year" event. So in the end, GW2 has a hidden token system. I mean, all of my characters have ascended jewelry. The laurels for that come from the daily login rewards. All of them have full ascended weapons and one of them is also in full ascended armour. Not one of those weapons or armours are a loot drop. They all are crafted, but to be able to craft them, i needed material and a boatload of the needed material, especially cloth and leather, i got from disassembling loot. 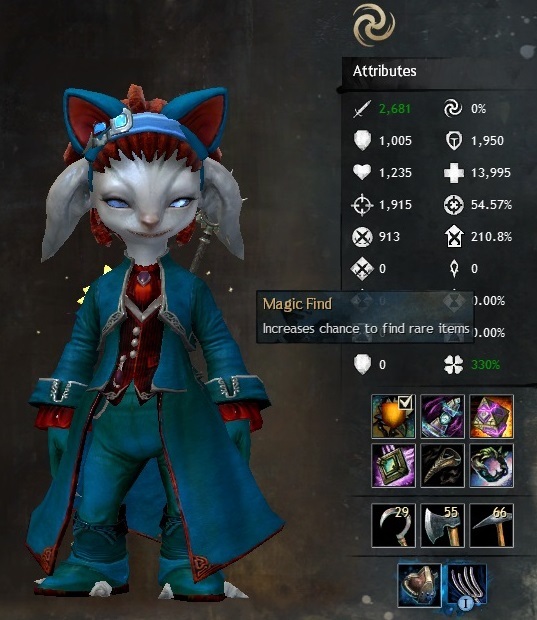 So effectively any loot in GW2 already now is just a token in disguise, and most likely the upcoming system doesn't change that at all, it just helps inventory management a little bit.I never counted, but i during normal play keep using the "deconstruct all" on my salvaging tool. Even after an hour or two of playing, i have a full 20 slot bag of green sigils, many of them being stacked up. That's before noting that less than half of the salvaged items give me a green sigil and before mentioning that i tend to sell higher quality sigils right away. So simply because of these numbers loot has to stay average, it's impossible to have hundreds of drops which all are of interest. I loathe DKP systems. I'd rather leave a dungeon or a raid with nothing than have to bid in a player-controlled system. I make a distinction between tokens, which I think of as you describe them - something you get specifically from doing an activity and which is taken by vendors directly attached to that activity (in GW2 the dungeon and fractal systems would fall into that category) and with "currencies", which you get for doing any number of things and which you can spend at any number of not-directyl-related vendors (in GW2 Karma and Gold would be currencies). I have no problem with currencies, only with tokens. And of course I still use tokens - I just don't enjoy it much. GW2 is a very bad example though. Most MMOs are messed up when it comes to loot but GW2 is catastrophically messed up! I don't get enthusiastic about lootboxes that need to be opened with real money bought keys either. I can't understand how that's attractive to people at all. That said, I don't like RNG that much overall, to be honest. I tend to like MMOs best if there's a mix of both. Barter stuff so there's something to work towards, RNG for the surprise element. I love variation in my gaming experience. "The first rule of magic find is we don't use magic find and that's also why we can't have nice drops." That gave me a good chuckle. Spot on there.